Hi Everyone! I'll be gone for awhile, as I'm leaving for paradise is a few days. 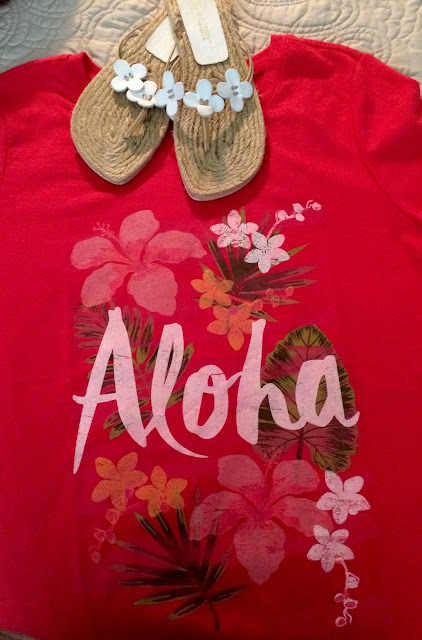 My youngest son, daughter-in-law and granddaughter are treating me to a vacation. Back in May, I watched Harper for several days, while they went to Mexico for a wedding. When they returned, they said that they wanted to go to Kauai and they wanted ME to go with them!! Can you believe it??!! I've been counting down the days, and now it's almost here. If you're so inclined, please say a little prayer for a safe and happy vacation. I'll be back to post pictures when I return. 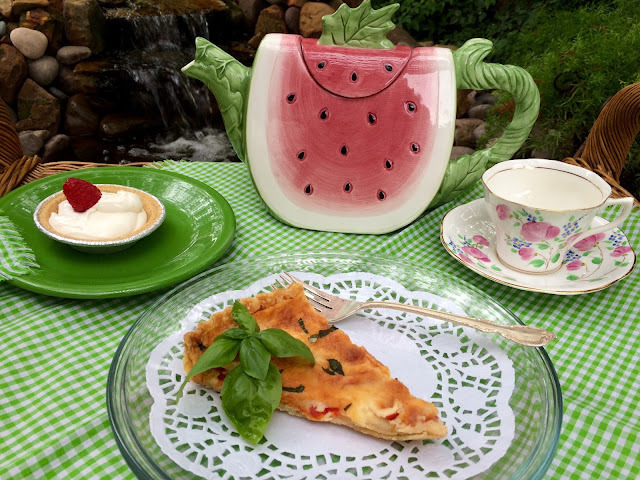 I am having one of my most favorite summer recipes of Tomato Tart, which can be found here. For dessert, I've fixed an Easy Creamy Key Lime Pie, which is cool and refreshing. Please join me for lunch! 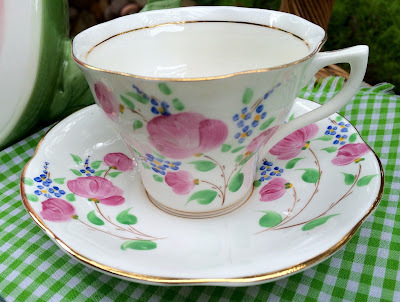 This Rosina teacup is one that I received in the teacup exchange, several seasons ago, at Stephanie's, at The Enchanting Rose. Stephanie will be having a sign up for her next teacup exchange in September, if you'd like to join in on the fun! 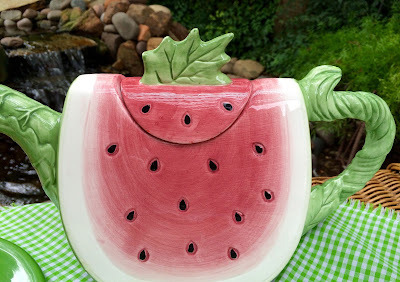 I just had to use my watermelon teapot again before Summer is over. 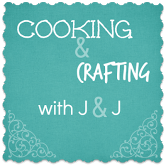 This yummy recipe was a favorite of my daughter's and mine, years ago, and I decided to make it. Her little girl wanted to try it, when she was over, and she LOVED it. 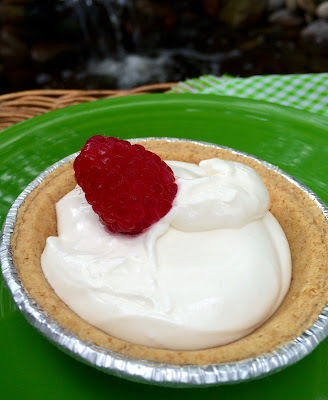 This recipe is lighter and fluffier than the other key lime pie that can be found here. They're both good! Beat sweetened condensed milk and lime juice in a large bowl on medium speed for about 1 minute, until smooth and creamy. Fold in whipped topping. Pour into crust. Refrigerate 2 hours or overnight until set. You can also freeze the pie and then remove from freezer 10 minutes before serving. 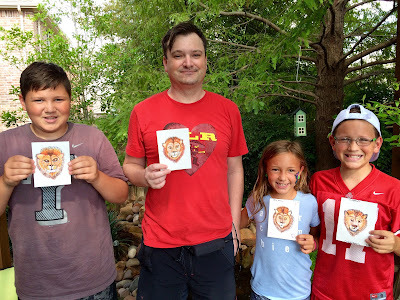 These two sweetie pies, who are also brother and sister, and my daughter's two youngest of four, haven't missed a Cooking/Art Camp all summer! 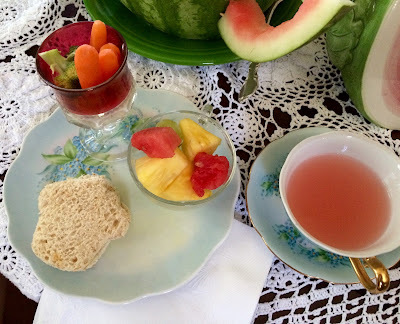 We planned a special tea party for today. Even my soccer-loving grandson was such a good sport about it, and got right in with the preparations. 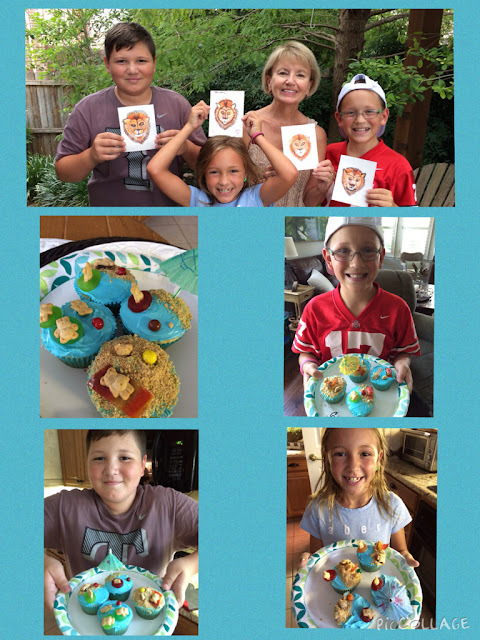 A few weeks ago, when we made the Teddy Bears at the Beach Cupcakes, we dyed half the batter green, and baked the extra cupcakes and froze them. On party day, we frosted them, and the kids even used my decorating tube. They did a great job, don't you think? They even carefully arranged the chocolate chips on top for the "seeds". I'm so proud of them! 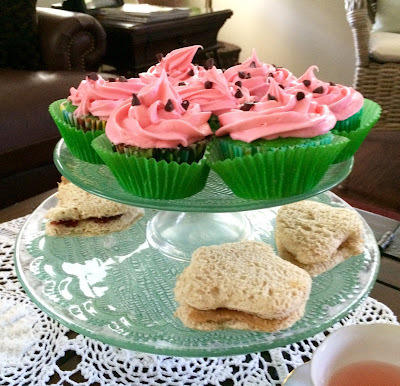 Look how pretty they placed the cupcakes on the tiered plate. They even chose special cookie cutters from my collection, to cut out their sandwich shapes. I carved the watermelon into a teapot the day before the party, with instructions that bloggy buddy Lynn, sent me awhile back. I've been holding on to these instructions for our special tea party. If you'd like to make a watermelon teapot, check here. 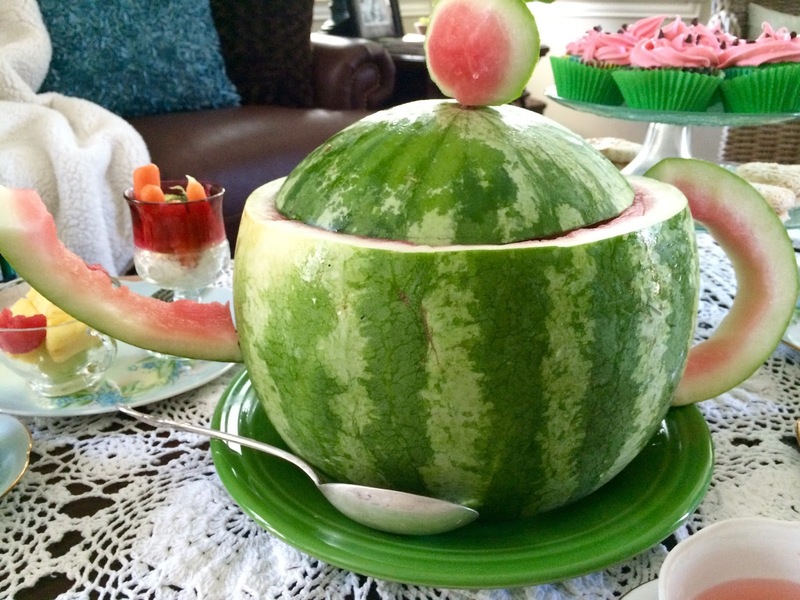 The only thing that I did differently was not to use a bottom slice underneath the "teapot", as I didn't feel it was necessary. Thanks, Lynn, for thinking of me and my Cooking Camp. This was the perfect centerpiece for our party, and that's where the kids placed it! Look how my grandson fixed our plates and poured our drink! 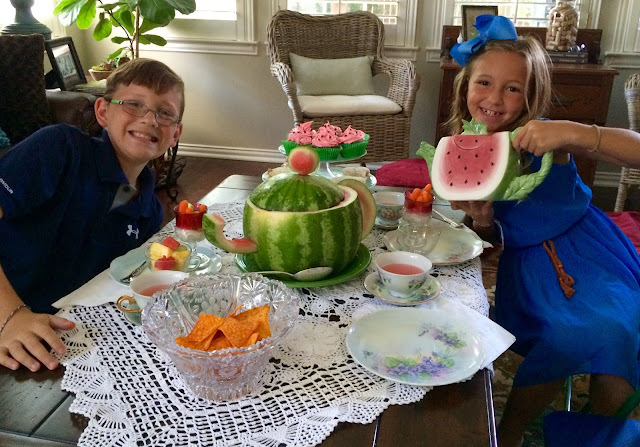 We sure had a fun time at our special tea party! The kids picked their favorite painted trios that my Late Great Aunt Kitty gave me. 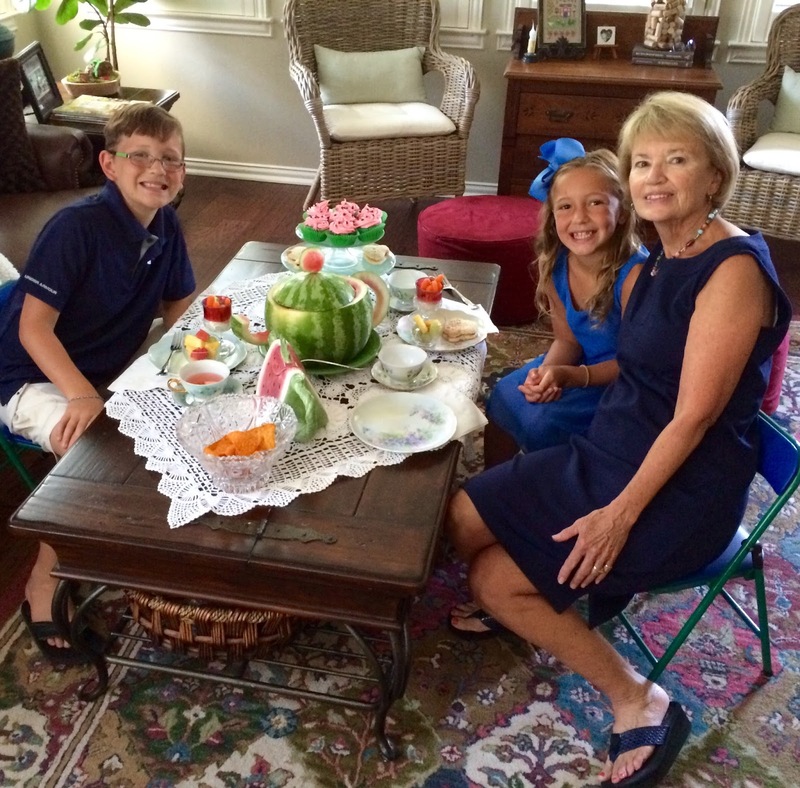 Didn't the kids do a great job on setting the table, and arranging the table and chairs? The sweet kids even dressed up, and the funny thing is, we all wore blue! Uncle Mike had his Art Camp and taught us how to watercolor a watermelon, and it was a fun, easy project. 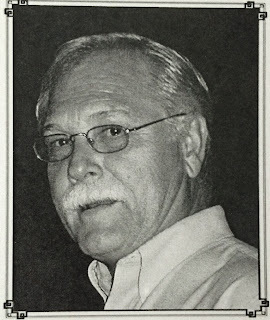 On August 16th, it will be the 3rd Anniversary of my Beloved's passing into eternity....he's forever in my thoughts and in my heart. Quick, we have to ice our ice cream before it melts in the 100 degree days we've been having! 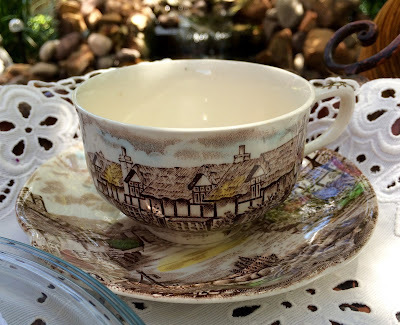 This Olde English Countryside teacup, by Johnson Brothers, is a favorite of mine, because I love cottage scenes. We'll pretend that we are in the cool, countryside of England. 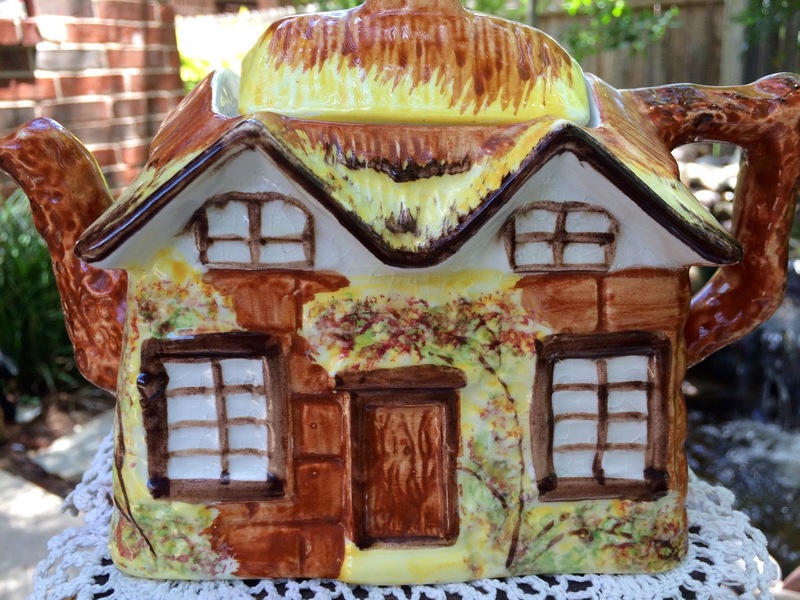 This Price Kensington cottage teapot was a last year's purchase from eBay. When it arrived, there was a big chip out of the bottom right corner. I wrote the seller and wanted to send it back, but he offered to refund some of the money, and I decided to keep it. I filled in the large chip with spackling, let it dry, and my son, Mike, painted it, blending it perfectly, and varnished it. You can't even tell, can you?? 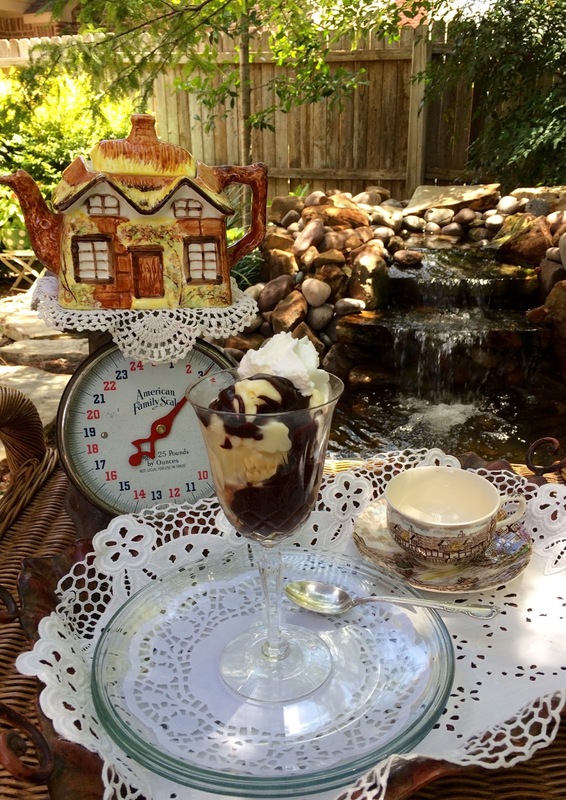 I'm using my crystal wedding goblets, which are Elyse, by Franciscan, for my hot fudge sundae. Don't you love how I put some hot fudge sauce in the very bottom as a nice surprise? Yes, I ate the whole thing! Combine the pudding mix and sugar in a large bowl. Slowly stir in the whole and evaporated milks. Continue stirring until the mixture is smooth. Churn the mixture in an ice cream maker according to the manufacturer's directions, then freeze until firm. 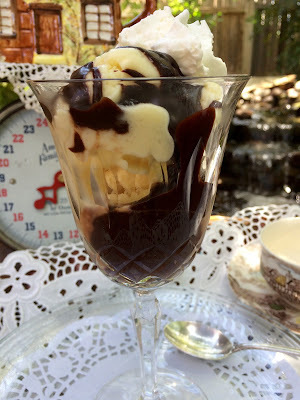 For Hot Fudge Sauce recipe, click here. 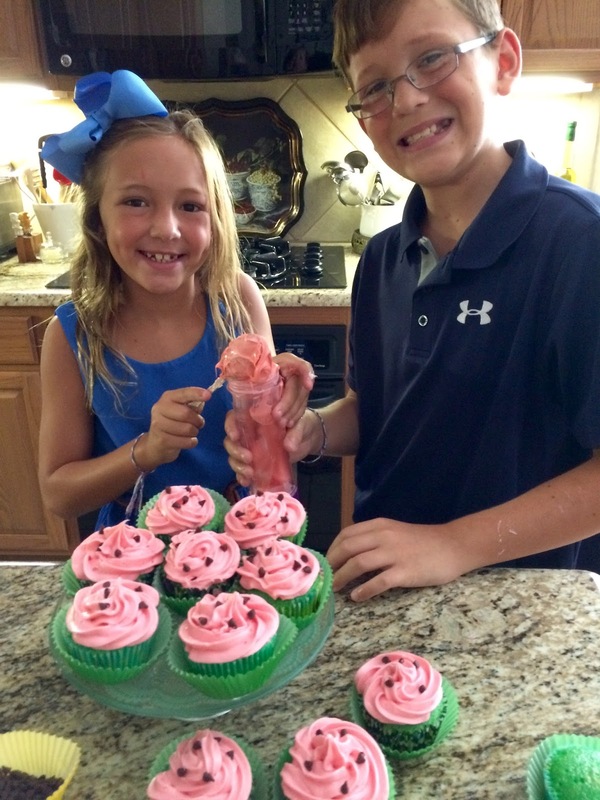 This week at Nana's Cooking Camp, these two grands loved making the easy vanilla ice cream. We also made Rice Krispie treats and decorated them with colorful sprinkles that they picked out from my cupboard. 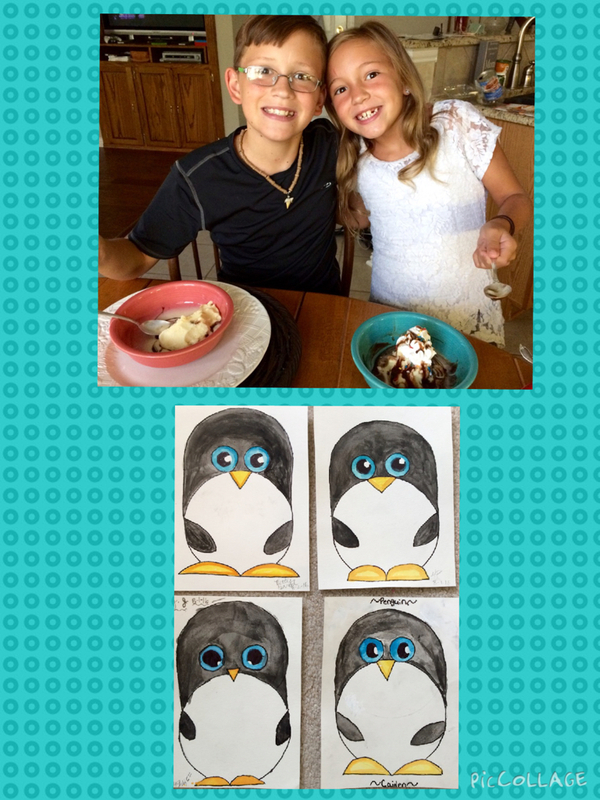 Their Uncle Mike gave a lesson in drawing the darling penguins, to go with our icy theme, and then we used watercolors to paint them. Top left is mine, top right is Mike's; bottom left is Cissy's and bottom right is Caiden's. 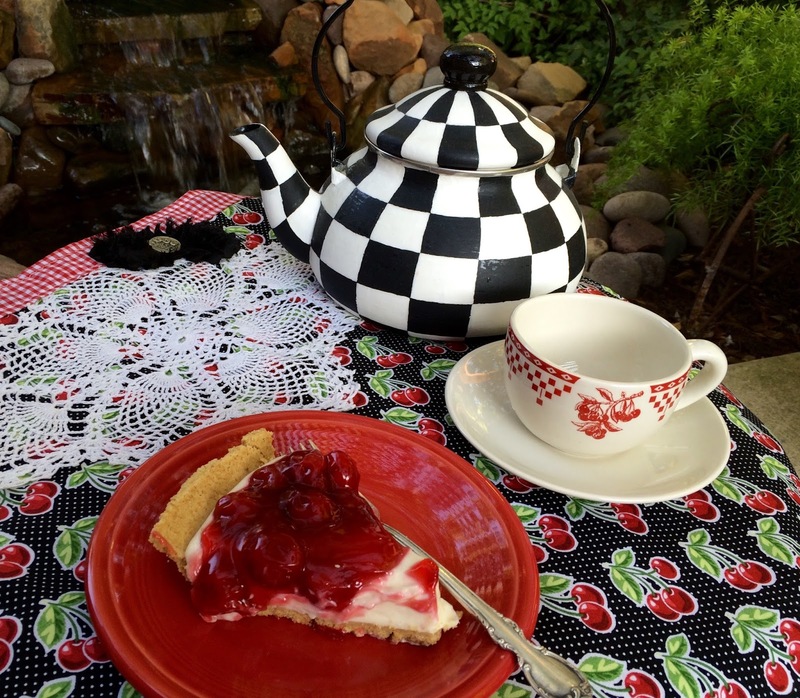 I'm in a no-bake mode for our sweltering Texas heat and this cherry cheesecake fits the bill! 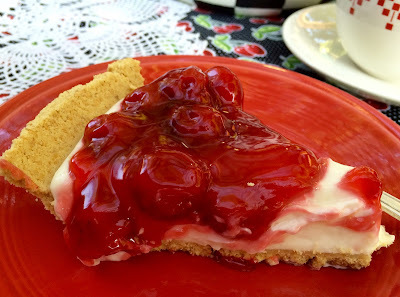 Although it's technically not a cheesecake, it's what my family has always called it and how it was named on the recipe from long ago. 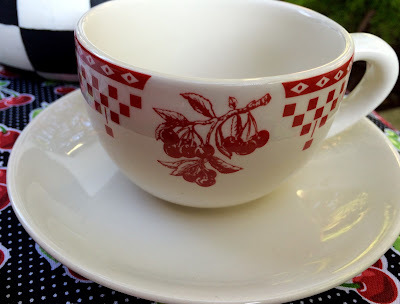 My table covering is actually an apron from Stephanie, and looks perfect for my cherry theme. 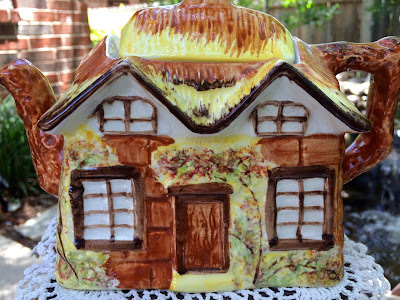 The tea kettle was done by my son, Mike, to resemble a McKenzie-Childs Courtly Check design. Of course, I had to use my cute cherry teacup that I received from Deborah, which reminds me of an old-fashioned diner and makes me smile. 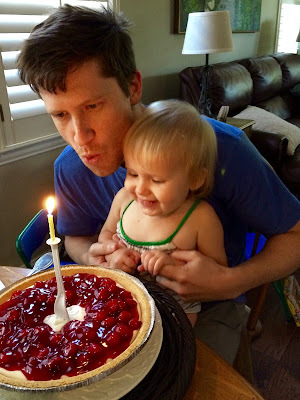 My youngest son, Kevin, came over when his wife was out of town, and I made his favorite birthday dessert that he's requested every year, since he was little. Little Harper looks so excited to help blow out the candle, doesn't she? She takes after her Daddy and loved the cheesecake, too. Beat cream cheese until fluffy. Add sweetened condensed milk, lemon juice & vanilla. Pour into crust. Add cherry pie filling on top. If you have time, make a homemade graham cracker crust. It's SO much better than store-bought!!! In a food processor, crush the graham crackers. Add the sugar & the melted butter. Mix again. Pour the crumbs into a 9" pie pan. Pat the crumbs down & up the sides of the pie pan. Bake at 350 degrees for 8-10 minutes. Cool before filling. At last week's Cooking Camp, the three of my seven grandchildren that could come, suggested that we make Teddy Bears at the Beach Cupcakes that we had made a couple of years ago. It's really fun to do with kids. You can check out the recipe how-to here. I just love how the kids enjoy these creative food activities and it delights this Nana's heart to be with them! 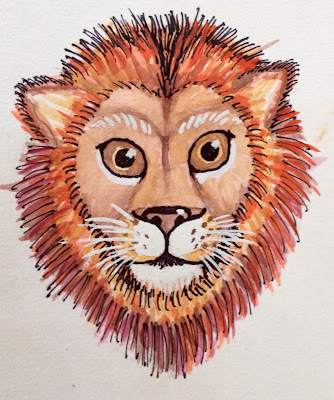 My son, Mike, did an Art Camp with them, and we used water colors to paint our lions. Here's Mike's drawing and painting that he did! 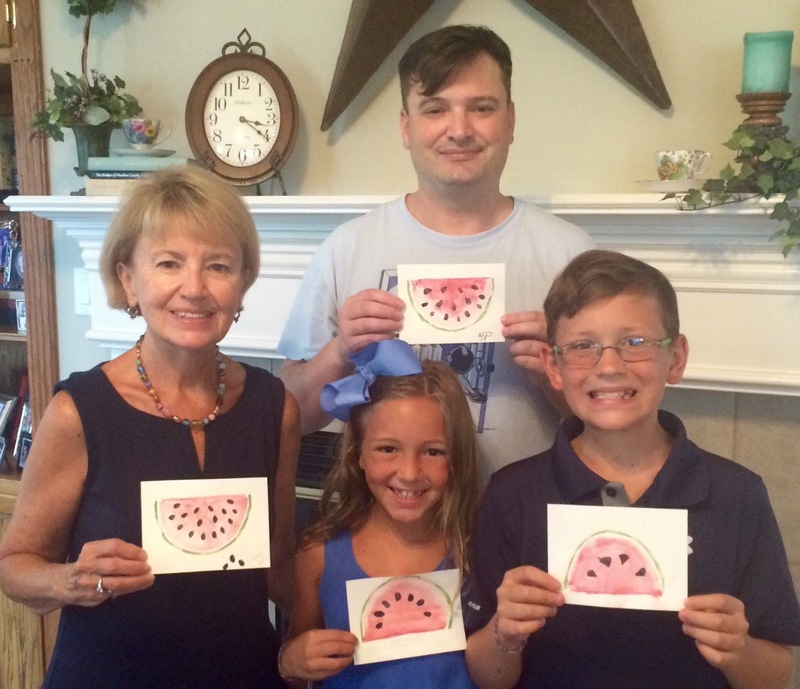 Here is Mike with his niece and nephews! The contraption that is on the front of Mike is his rechargeable battery pack for his spinal cord simulator that he had inserted in his back over a year ago.